Summer is the weather when you actually drink more than eat.The hot weather affected us too in the trip last week.Children were all drained out.Every where you find the ice cubes piled up,colas and water bottles in plenty.I had some blue berries in the refrigerator and so I came up with the idea of a shake.Blue berries have lot of phyto nutrients,anti oxidant and a rich source of vitamins.The colour itself is so refreshing that you actually fall in love with it.The topping with whipping cream gave an additional taste.This is a very quick recipe and a thirst quencher too. Blend the blueberries and then add the milk to it. Add sugar as per taste and blend again. Pour into glasses and serve chillied with whipped cream topping. Wishing all a happy weekend too!! 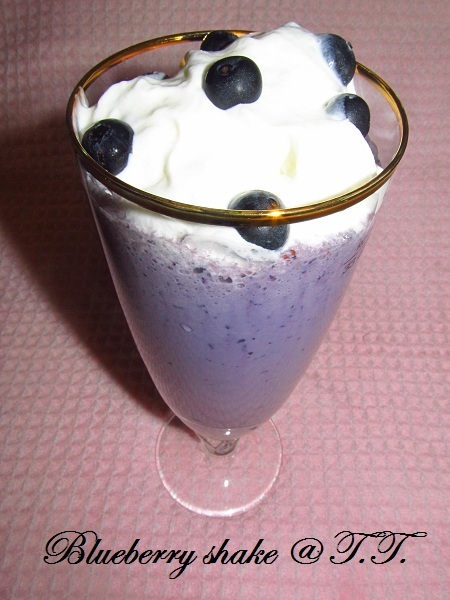 wonderful and refreshing shake..love the colour..adding cream topping is a good idea..
Yummy & filling shake..love the colour. That's a such an appetizing drink, lovely colour, too! Nice one with blueberries .. lovely color. Very refreshing & delicious shake, so healthy! Looks refreshing and delicious indeed..loved the whipped topping on top!YUM!! Yuuuumy! Looks so good! Perfect anytime of the day! Have a lovely weekend! Yummy shake!!!!!! I too love the color!! That looks Super slurpy yuM! Love blueberries - will be posting my bb-pie soon, hopefully! thanks for a lovely comment Julie. Lovely color of the shake..nice n refreshing with cold milk. Perfect and tempting juice.. looks absolutely inviting..
look at that colour...lovely recipe...yummilicious. 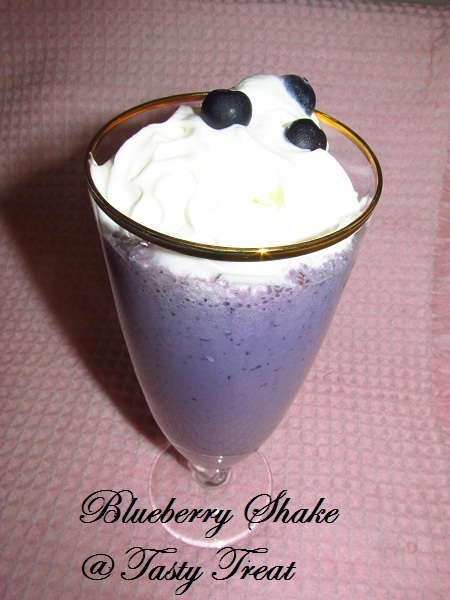 I have never heard abt this shake.Daily u r coming up with new dishes n shakes.Really appreciate ur hard work for this blog......Excellent blueberry shake..
i also posted a blueberry juice last month..thats because i simply like its highly nutritous value. it will be a loss not to consume thm.